So, once you manage to put together your TIFF schedule, and actually get your tickets, you’ll be ready to Go To The Movies! 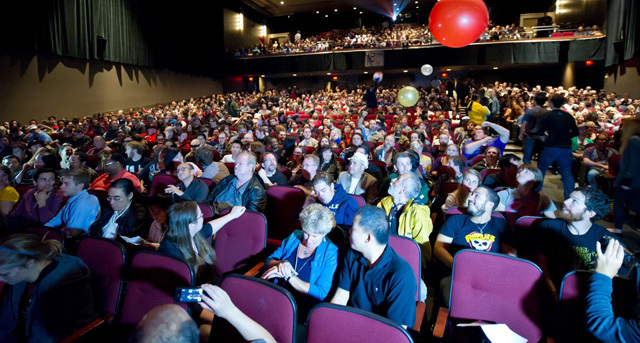 Seeing a film at the Toronto International Film Festival isn’t exactly the same as going to the regular movies (even if it’s at the Regular Movie Theatre). So, we’re offering all the tips and tricks we’ve learned over the years for each and every one of the venues that hosts the Film Screenings you’ll be attending. 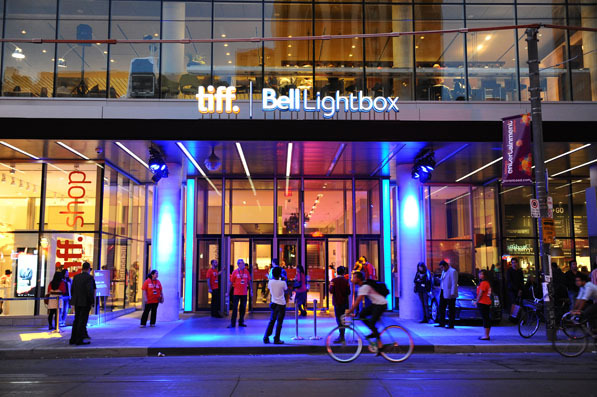 The very first thing you’ll need to know about attending a Screening at TIFF is that you need to get there much further in advance than you regularly would for a normal movie. As a general rule we tell people to arrive at your venue AT LEAST An Hour before the screening is scheduled to start. For those attempting Rush Line, more like three hours ahead of time. At each and every venue there will be multiple line ups – at least two (Ticket Holders and Rush Line), at venues with multiple screens you’ll have two per screen. Ask A Volunteer which line you need to be in – every time – just to be safe. So, ok, you have to wait a while to get in – but it’s not so bad if you’re prepared. Bring a book or Tablet. Nothing is better for surviving the Festival than bringing a fellow Cinefile. Misery and excitement both love company. There’s rarely a place to sit down*, so why not bring your own? Something no bigger than an umbrella. Especially helpful if you’re rushing between films. Something quick, like chips, veggies or nuts. Most theatres won’t let you bring in anything besides water (and they can be strict), so finish it before you go inside. If you didn’t arrive more than an hour ahead of time, even the Ticket Holders Line is gong to look endless. You might get cramped together, you might not be able to even use your folding stool – the line ups are often outside, regardless of the weather. 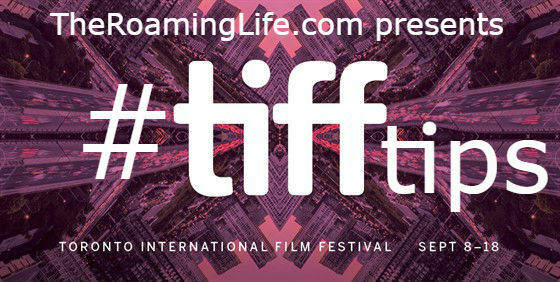 There’s no doubt that besides the frustration that goes along with Ticket Purchasing, the Line Ups are the worst part of TIFF – and I’ve heard from multiple people that this can be the sole reason people avoid going to The Festival all-together. Don’t despair – once you’re stocked up on your supplies you’re ready to brave the theatres. Food/Drink: Although they sell beer, wine, snacks and water at concession booths, you’re sometimes not allowed to bring them into the Theatre itself. My Opinion & Advice: Your ticket will likely say “Balcony” on it, and unless you get an upgrade in line (which happens probably 50% of the time) you’re not allowed to sit anywhere but in the rafters. The view to the screen is still decent, but if you’re afraid of heights, this might be a problem. As there’s no chance you would have seen the actors arriving (see below), at least they usually have a live video feed of the Red Carpet. I find that Q&As at this theatre are rare (Despite every single one of the screenings being Premium Price). Ticket Holders Line: Starts at King & Duncan, continues up Duncan Street. Uncovered, no seating. Food/Drink: Water & Popcorn, other theatre snacks. My Opinion & Advice: We stood in the Rush Line (for over three hours) and got nosebleed seats for 12 Years a Slave. Still totally worth it – there’s not a bad seat in the house. It’s a giant venue – so the Ticket Holders Line is going to be very, very long. The volunteers posted on ever corner will help you navigate it. Ticket Holders Line: Elgin and Winter Garden are actually in the same building, with Winter Garden stacked on top of the Visa Screening Room in Elgin. The lines for both start at the main doors and goes north up Young, then down Shuter. The lines for Elgin & Winter Garden often get confused or co-mingled, so don’t be afraid to ask a volunteer (don’t trust the people in the line, they could be just as confused). If you’ve got a certain kind of Visa Card (Gold or above), there’s at least the Priority Lane (which takes up the other half of the sidewalk), and sometimes the Lounge is available (but not always). Food/Drink: They sell Popcorn and Water, and that’s it. My Opinion & Advice: One of my favorite venues because it’s so ornate, and although it’s a large theatre, there are hardly any bad seats. 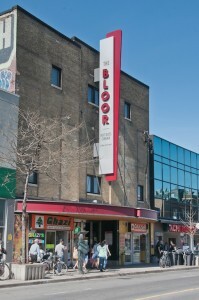 Ticket Holders Line: See above; it’s along Yonge Street, and not separate from the Elgin line up – be sure to ask about your specific film! Food/Drink: Same as Elgin; Popcorn or Water. My Opinion & Advice: Be prepared to Hike – the theatre is seven stories up., although patrons with disabilities can use the elevators. 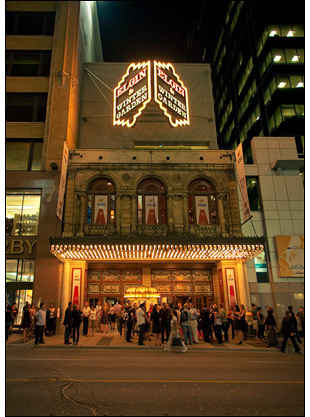 The theatre is very similar to the Elgin below, although perhaps a few degrees colder, maybe a pun on “Winter” garden? Bring a sweater! Ticket Holders Line: My favourite line, by far. Starts at the main doors, goes West, then North on Church. There’s a lovely concrete planter that wraps around the building, which provides seating for nearly everyone in line. Perhaps it is because of this that I find Ryerson’s line up to be one of the friendliest, especially for Midnight Madness. Food/Drink: Ryerson has one of the strictest policies – No Food or Drink allowed (only water). My Opinion & Advice: Although I love the line, and the general atmosphere that Ryerson provides (it’s not too giant, not too small), I hate the near-flat seating. As someone who is short I’ve been burned by even a slightly taller person sitting in front of me, and been unable to see subtitles. Now, I exclusively sit on the left or right-side isle of the outer rows. Also – Ladies Bathroom Hack – there are only a few stalls in the main washroom that everyone uses, and therefore always a line. Instead of turning right at the bottom of the stairs, go left – there’s a secret 2-stall bathroom just beyond the pool (and even another further down). 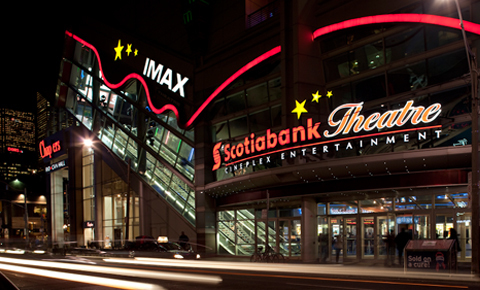 Ticket Holders Line: There are multiple theatres showing films within the Scotiabank complex (ex. Scotia 1, Scotia 4 etc). The line ups can be anywhere from on the Street below, or right outside the theatres, or in the upstairs lobby. They try to label them, but you will have to ask a Volunteer here nearly every time just to be sure. The entire Theatre is booked up for TIFF so the building is swarming with them. Food/Drink: This movie theatre’s got everything. Popcorn, Pop, Candy, Hot Dogs, Pizza, Dippin Dots, Fancy Popcorn and even a Bar! My Opinion & Advice: It’s just like going to the regular movies, only a much (much, much) longer wait. Ticket Holders Line: Outdoors, usually starting at the doors, going west – then up Albany St. No seating. Food/Drink: Regular cinema grub, popcorn, pop, candy, etc. My Opinion & Advice: The theatre was recently refurbished, and in doing so they added a larger screen. If you’re seated in the back part of the lower level, or certain parts of the mezzanine, the screen is actually cut off a the top (annoying) or bottom (goodbye subtitles). I’m not a huge fan of this cinema to be honest. Ticket Holders Line: Outdoors, down the street. No Seating. Food/Drink: As far as I recall there was no food, however there may be a concession selling water. My Opinion & Advice: I’ve only been here once, which is a shame because it was a very nice imitate venue, an absolutely perfect place for an extended Q&A. Ticket Holders Line: Outdoors, partially covered (if same location as when I attended). No seating. 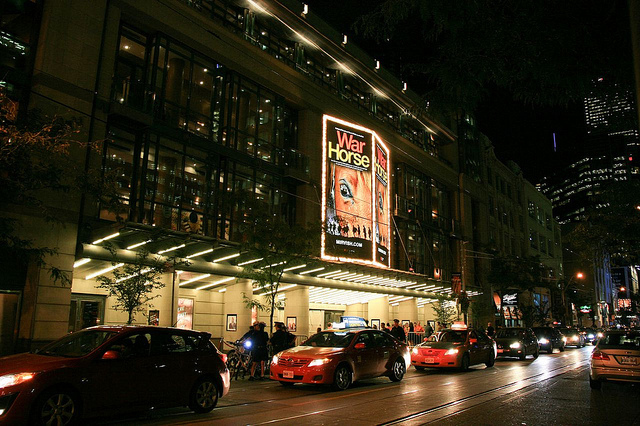 My Opinion & Advice: I’ve been to this theatre twice, only once for TIFF. It’s teeny-tiny, and would be a great place for Q&As. It will be the host for all video & art pieces in the Wavelengths Programme. Ticket Holders Line: I’ve seen them outside, in the lobby, and upstairs. Could be anywhere, really. Ask someone. Food/Drink: Thankfully they sell regular movie-theatre treats, and some upscale baked goods. There’s also Canteen or Luma on-site if you want to grab dinner before or after. My Opinion & Advice: The actual theatres are really fantastic, good stadium seating, and great set up for Q&As too (they always have a Mic). Bring a sweater though – we’ve nicknamed the Lightbox “The Icebox”. 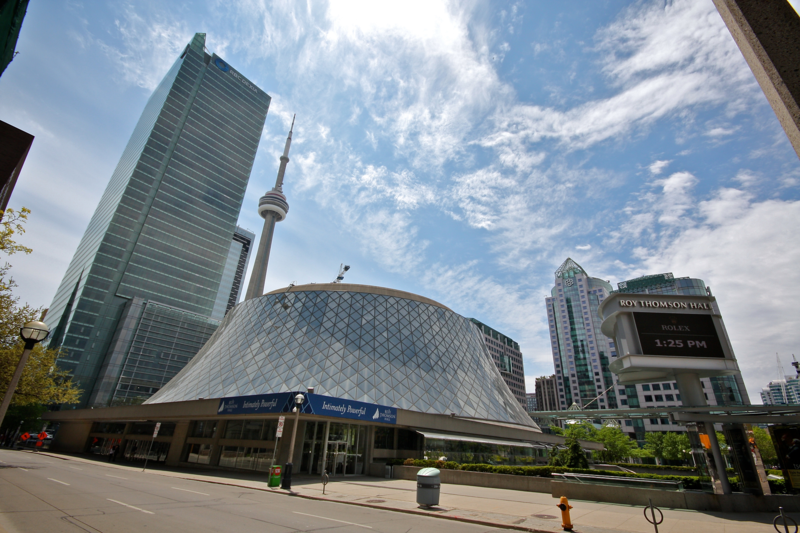 Closest Subway Station: St. Andrew or Union Station. My Opinion & Advice: I’ve only ever even been to this building one time – seems like a nice venue for concerts and similar to Isabel Bader – only possibly larger. We’ll keep you updated, though and add anything of note as the festival begins.